The Fountain Theatre's West Coast premiere of The Ballad of Emmett Till, a tribute to a tragic event of the Civil Rights era, opens Feb. 20 after previews from Feb. 11 in Los Angeles. The script has been revised since its 2008 world premiere in Chicago. The staging has become a tribute to a Fountain family member. Director Ben Bradley was preparing the show when he was slain in his home in early January, shocking his friends and colleagues. His alleged killer was arrested within days. Rehearsals were put on hold, start dates for the gospel-infused work by Ifa Bayeza were changed and Shirley Jo Finney stepped in as director. "Because Ben loved the play and the project so much, we were determined to go forward," Fountain co-artistic director Stephen Sachs said. "Shirley Jo is a fabulous director and a longtime member of the Fountain family. Ben worked with her many times and adored her." 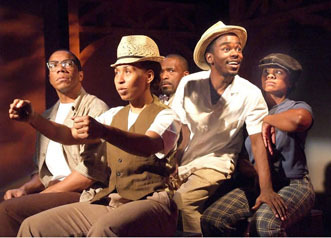 The cast includes Bernard K. Addison, Rico E. Anderson, Lorenz Arnell, Adenrele Ojo and Karen Malina White. 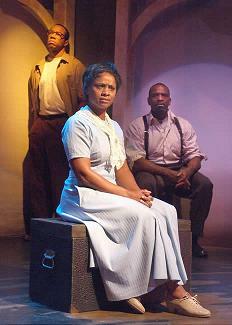 According to Fountain production notes, "Part history, part mystery and part ghost story, Bayeza's jazz/gospel/folk integration of past, present, fact and legend turns the story of the 1955 murder of 14-year old Emmett Till, whose shocking death helped spark the nascent civil rights movement, into a soaring work of music, poetic language and riveting theatricality." 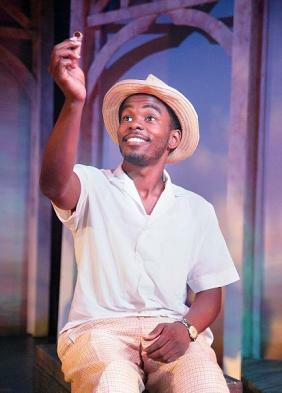 Bayeza "has newly conceived The Ballad of Emmett Till for the intimate Fountain space, giving the award-winning play, which premiered at Chicago's Goodman Theatre last year, a whole new spin." "How do you re-think an epic piece for a 78-seat theatre so that it becomes a uniquely intimate experience?" she asked. The result, said Fountain co-artistic director Stephen Sachs, is a 90-minute version with a cast of five that "celebrates a young man who lived, not an icon who died." Bayeza is an award-winning playwright, producer and conceptual theatre artist. Her works for the stage include Amistad Voices, Club Harlem, Kid Zero, Homer G & the Rhapsodies, for which she received a Kennedy Center Fund for New American Plays fellowship, and The Ballad of Emmett Till, which received its world premiere at the Goodman Theatre in May 2008 and which garnered the 2008 Mystery Writers of America Edgar Award for Best Play. The creative team includes set designer Scott Siedman; lighting designer Kathi O'Donohue; costume designer Naila Aladdin-Sanders; sound designer David B. Marling; dialect coach JB Blanc; production stage manager Elna Kordijan. Stephen Sachs and Deborah Lawlor produce. The Fountain Theatre is located at 5060 Fountain Avenue (at Normandie) in Los Angeles. For reservations and information, call (323) 663-1525 or go to www.FountainTheatre.com.